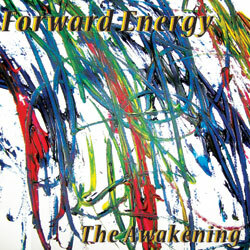 bebopified: CD review: Forward Energy's "The Awakening"
CD review: Forward Energy's "The Awakening"
Many jazz musicians, fans, and members of the press know Tim Orr as the hard-working, Scotch-appreciating marketing associate/media relations dude for the Monterey Jazz Festival. More should know him as a drummer. Orr studied with Ed Blackwell at Wesleyan in the '80s, then worked variously for Virgin Records, MCA, Arkadia, at the Brubeck Institute, and as a freelance journalist ("Traps," "Drum") before signing on with Monterey in 2006. He has been performing since 1976 ("1500 gigs and counting," his words), playing in rock bands, musical theater, Cajun and zydeco bands, jazz and blues bands, and improvising/avant-garde/experimental/free jazz groups. Orr is a member of the current formation of Jim Ryan's Forward Energy quintet. Their latest CD, "The Awakening," came out in March on Edgetone Records. I prefer my free jazz live, when I can observe the musicians interacting and feel the physical energy of the room. (I don't mean that in a woo-woo way. Live music is a physical thing. Wood and brass, strings and reeds and skins vibrate. People breathe and sigh and sweat. Depending on the room, you may sense the music in the air, your chair, and the floor beneath your feet. Dubious? Google Evelyn Glennie.) On the other hand, live music is ephemeral. You can't wonder, "What was that?" and back up to hear it again. Lacking a choice--I'm in Minnesota, not in California, where Forward Energy mostly performs--I listened to the CD. It will sweet-talk you and knock the fillings out of your teeth. Orr has described "The Awakening" as "a little user-unfriendly." For people who have never heard free jazz, that's a fair description. This is not music that cuts you any slack. You have to be willing to listen, or at least stay put and not run the other way. If you can suspend temporarily your expectations of how music should sound and just let it sound (and let it be sound), you might like this. I did. I believe more people would enjoy free jazz if they stopped chanting "I-don't-understand-it" long enough to listen. What seems to be a wall of noise reveals itself like a pointillist painting. Phrases surface, and rhythms, and dialogues between the players, and jokes, and camaraderie, and negotiation, and musical arm-wrestling. Forward Energy is Ryan on alto and tenor saxes, flute, and trumpet; Rent Romus on alto, soprano, and c-melody saxes; Scott R. Looney on piano and prepared piano; Eric Marshall on double bass; Orr on drum kit and percussion. None of the instruments is treated very gently. They're pushed, banged, pounded, and blown hard. Things are dropped. The first track, "The Opening," starts with a few piano chords, then everyone jumps in and the group runs full bore for nearly six minutes before collapsing at the finish line with a final squeak. And it swings. The title track, "Awakening" is softer, more restrained. A collection of individual voices and sounds--Looney strumming and hitting prepared piano strings, bowed groans on Marshall's bass, the patter of Orr's drums like rain--it never solidifies. Not that it should. The flute holds it together, but barely, like a silken thread. Don't turn up the volume for the third track, aptly named "Float & Jolt." Distant notes you strain to hear are blown to bits by sudden, unpredictable blasts of sound. It's a sonic minefield. "Lost Leprechaun" is a free-jazz ballad, Looney's piano minimalist and harp-like, Orr making faraway thunder with his mallets, Ryan's trumpet and Romus' saxophone doing a dance. Chimes ring over tender arco bass to end. "Freestyle" is fierce and noisy, with plenty of room (at 12:55) for lengthy solos. Orr is a maniac almost all the way through, beating the cymbals senseless and spraying the room with machine-gun fire. And he still manages a rock-god solo in the last few moments, after which the rest of the band returns for a full-out assault. Witty and playful, "Carpenter Shop" is one of my favorite tracks, starting with hammerlike percussion, adding repeating piano chords, swooping saxophone, sliding bass, and a too-brief saxophone duo. Glimpsed through the mayhem are moments of real loveliness on piano and bass. "Wishful Thinking" opens with piano strings and a sound I wish I could see being made--something spinning? (From Orr: "The spinning sound is a small hand-held fan pressed lightly against the piano strings.") Gauzy at first, the music becomes more intense, insistent, frantic, loud. It's bedlam until the bass restores order. "Talk Talk" brings voices into the mix as someone hums and mumbles into a mouthpiece. (Except for "Lost Leprechaun," the titles actually seem to have some relation to the music, or am I just imagining that?) Enter Ryan's sax, in walks the bass, and the two saxophones hold a back-and-forth that escalates into a brawl urged on by the piano, bass, and drums. In the end, it seems that everyone gives up and goes home. "Late Nite Show" features Ryan's flute, alternating high, sharp sounds with flowing lines. Everything else seems loose and uncontrolled; bursts and pops of sound. "Whatabout ThaBlues," the final track, is a solid conclusion. If we've been paying attention for the past hour, we've gotten to know something about the individual musicians. their sounds, and the choices they make. "Blues" starts with questing saxophone, moody percussion, and low, sawed grunts from the bass, then picks up speed and takes to the air. It circles the idea of melody, gives us a few near-hummable phrases, and tries out a few rhythms without straying too far from its improvisational soul. I love Looney's piano paired with Marshall's growling bass, followed by blatting, discordant saxophones; Romus plays two at once, like Rahsaan Roland Kirk. A few crashes from Orr's drums, a fading chord on Looney's piano and we're done. Random closing thoughts: "The Awakening" is music for the experienced listener to free jazz, or the very open-minded sophomore. High-energy, imaginative, limber, full of surprises. Vast and thorny. Provocative and challenging. Never predictable or dull. Far out, in the best way. Worth hearing again, and again.